Vagad`s Khadi Mineral Oil Free Lemongrass Massage Oil is an effective cleanser for all types of skin. its antiseptic and astringent properties make lemongrass oil perfect for getting even and glowing skin. It also uplifts your mood and stimulate your senses. Vagad`s Khadi Mineral Oil Free Lemongrass Massage Oil has revitalising effect on body and mind.Its invigorating scent is known to boost vitality and awaken senses. 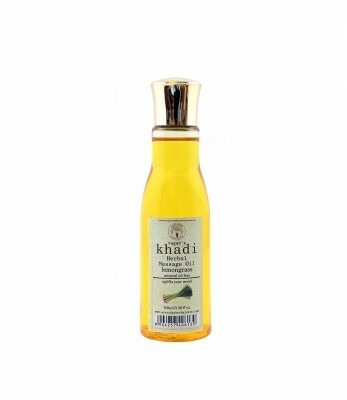 Vagad`s Khadi Mineral Oil Free Lemongrass Massage Oil it has soothing and calming effect on the body. Vagad`s Khadi Mineral Oil Free Lemongrass Massage Oil is free from mineral Oil thus provide deep nourishment to your skin. Massage gently on the skin for few minutes.